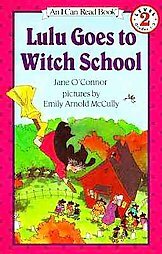 In this I Can Read sequel to Lulu and the Witch Baby, Lulu is off to witch school with her broom and Dracula lunch box. Her teacher, Miss Slime, is pretty, with a long nose and wart on her chin. She teaches everyone to fly around in the graveyard, and Lulu proves herself worthy of the name "witch." Sandy Witch, howevera kid with an unholier-than-thou attitudeproves worthier than Lulu. The two harbor intense dislike for one another, but become friends when they both catch the lizard pox. This story is funny and full of the "gross" details kids lovelike having snake flakes for breakfast and eating lizard tarts. McCully's simple, freehand illustrations, washed in watercolors, add a good dose of silliness to an already absurd and fun idea. 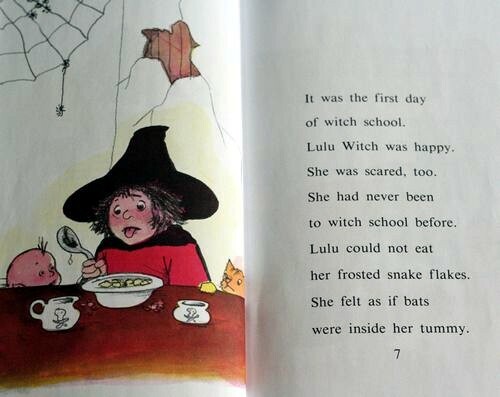 Grade 1-2 Arriving at school on her very first day, Lulu Witch meets her teach er, who ``had a long nose and a wart on her chin. Lulu thought Miss Slime was very pretty.'' This type of skewed perception should amuse beginning read ers. Lulu's apprehension about starting school and her initiation into the com plex social dynamics of a classroom are described concisely and convincingly. 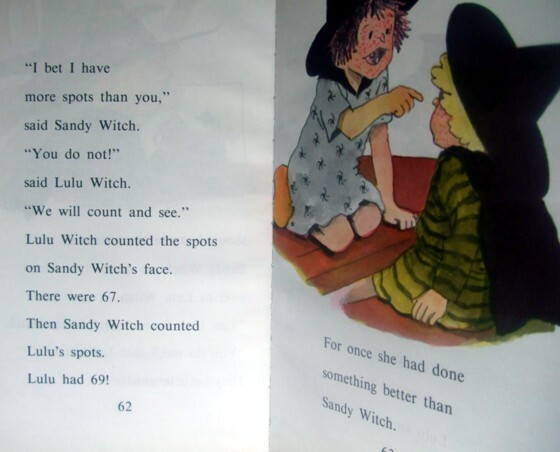 Lulu feels both envy and adulation to wards her perfect classmate, Sandy Witch. 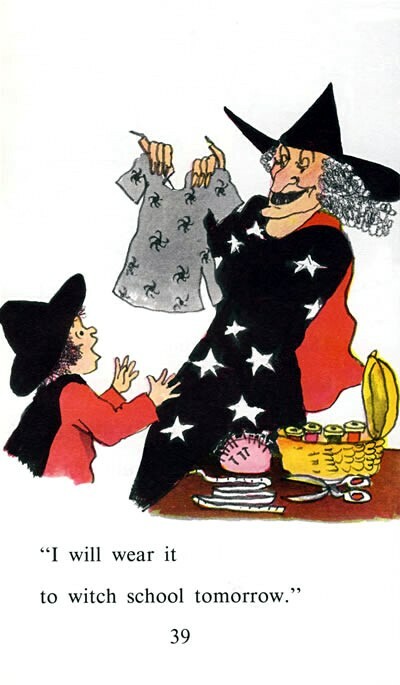 Sandy's hostility towards Lulu may be provoked by similar feelings on Sandy's part: when Miss Slime admires Lulu's new dress, Sandy casts a spell on it, changing the pretty spiders to hid eous flowers. 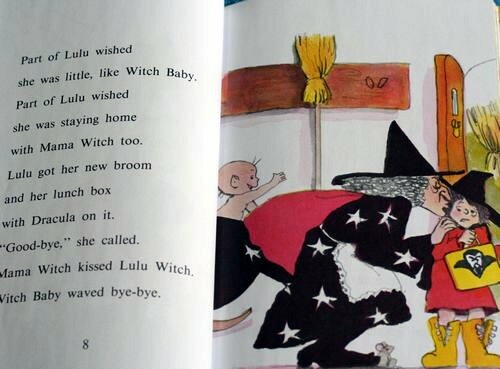 It takes ``lizard pox'' and a new independent spirit on Lulu's part to bring the two witches together at the end. McCully's watercolor wash and pencil illustrations add considerable charm and interest to this well-written story. Character is revealed with minimal detail (as when Lulu's anxiety and Sandy's smugness is shown in their first scene together). The humor wears a bit thin, but on the whole, Lulu. . . is a pleasant and appropriate choice for be ginning readers. Lauralyn Persson, Wilmette Public Library, Ill. This is the first book that my 9-year-old, mildly dyslexic daughter read all the way through without stopping. 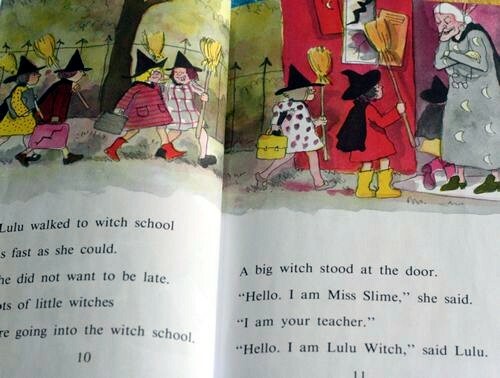 She was captivated by the problems Lulu Witch faces in starting school and making peace with difficult peers in school. "Why aren't there more Lulu books, Mama?" 这本书当初是抱着试试看的态度借的, 没有想到遥遥却非常喜欢, 我们一起看完一遍还不过瘾,自己又翻看了一遍, 然后第二天遥遥又想读这本书, 第二次读比第一次读顺利了很多, 没有夹杂中文解释, 遥遥自己还披上个毛巾被, 拿着个扫把, 自己当lulu witch, 要我当miss slime, 开始自己演了.